Naturally, finding a home will be one of your first priorities when you move to Canada. There are many housing options available to you in the different communities in the Bay of Quinte region. Many newcomers will stay with family, friends or a sponsorship family when they first arrive in Canada. There are many hotels available in the region as well for short-term stays. There are many options for buying and renting homes available to you in the Bay of Quinte region. Many people starting out in Canada will rent their first home. 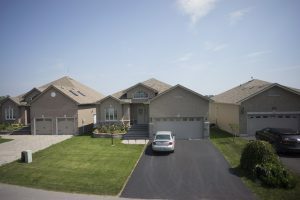 Houses, townhouses and apartments are available to rent in different sizes and neighbourhoods throughout the Quinte region. An average two bedroom apartment in a building in Belleville or Trenton rents for $900/month plus utilities. You will typically be responsible for the utilities, including heat and hydro (and may be required to pay a deposit) as well as tenant’s insurance. Most landlords will require a one year lease and first and last month’s rent from a new tenant. The landlord may also require a background or credit check before renting you a home. Homes that you rent will not be furnished with living room, dining room and bedroom furniture unless indicated otherwise but will include a refrigerator and stove. Some also include a dishwasher and laundry facilities but check to confirm. Banks typically require a 10% down payment on the purchase price of the home and will mortgage the balance to approved borrowers. Interest rates in Canada are at record lows (the prime rate in October 2015 was 2.7%) at this time making home ownership more affordable than ever before. The average selling price of homes in the Quinte region is $240,000 with several options available above and below that average price. Buying a home in the Bay of Quinte region is 24% less expensive than the national average home price in Canada of $314,900. Other costs of home ownership include municipal taxes, utilities, including heat, hydro, water and sewer charges and insurance. When buying a home, make sure to budget for lawyer fees, land transfer tax and other real estate closing costs.